Summer is in full swing here in the UK (well sort of) and I just can't believe how quickly its going. All my favourites this month are new discoveries as I have had a bit of a splurge as of late- oops! Rimmel Stay Matte Liquid Lip Colours- I did a full review on these little beauties so go and check that out if you want a bit more detail on why I love them. I have the shades Pink Blink and Be My Baby and they are both gorgeous but its the formula thats an absolute winner for me. I found them so comfortable on the lips, long wearing and not drying at all. Bravo Rimmel! Nyx Control Freak Eyebrow Gel- I needed something to tame the wilderness that is my brows and since I got this about a month ago I have been using it non stop. It's a clear gel that sets everything down well and doesn't leave my brows looking wet or feeling crunchy. I'm so impressed with this and for a brow gel its a pretty decent sized tube, the size of a mascara. Maybelline Baby Lips Lip Balm in Hydrate- My lips were getting super dry so I decided to get a new Baby Lips to wear under my lipstick/ liquid lippies, I went with the blue tube which is the hydrate formula. Hydrating it is! This has honestly saved my lips. This might sound strange but I really enjoy applying this, it glides on and just feels so nourishing. FrezyDerm Sun Screen Velvet Face SPF50- Another product I have done a full review on for those of you that are interested. This worked an absolute treat at protecting the skin on my face on holiday, usually I struggle to keep my face burn free as I'm so fair but this just needed one application a day and I was good to go. I also love the velvet finish as it helps to keep that shine at bay. 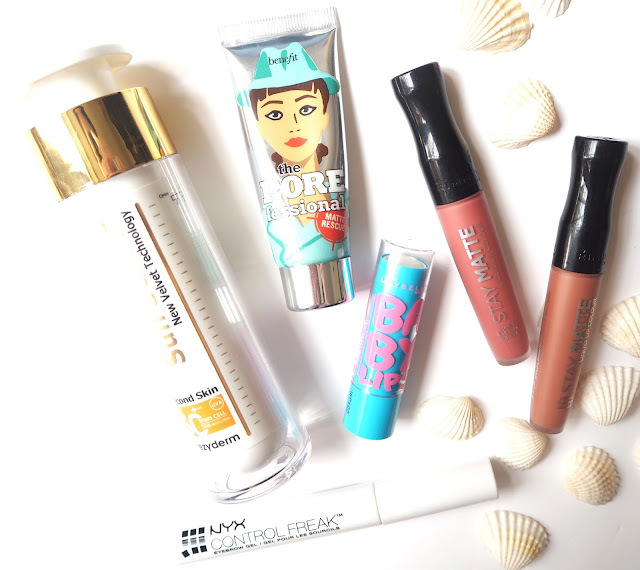 Benefit The Porefessional: Matte Rescue Mattifying Gel- This is a deluxe sampler size (if you were wondering why it looked smaller!) that I picked up at the airport on the way to my holiday. I got it on a bit of a whim if I'm honest as I get quite an oily t-zone and thought it was worth a shot. In the evenings I was applying this before my make up and I noticed a big difference in the way my make up lasted throughout, especially considering it was so hot. I've nearly used up this tube and have a full size one on my wishlist. What products were you loving throughout July?